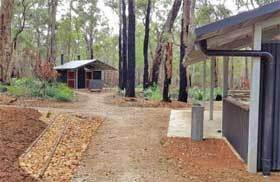 THE first stage of the new $2.7 million Jarrahdene Campground in WA's south-west is now complete. A total of 24 individual camp sites, five double-cubicle toilets and four barbecue shelters, as well as tables and fireplaces for each camp site, are available to visitors. Camp sites are suitable for caravans, campervans, camper trailers and tents. Located 21 kilometres south of Margaret River, Jarrahdene Campground is next to the remains of the State Heritage-listed Jarrahdene Mill, which was built in 1896 and was the centre of the local community and economy. The completed campground will eventually feature 36 camp sites and two group camping areas. It will also include interpretive signs about the heritage of the old Jarrahdene Mill. Environment Minister Stephen Dawson said camping in the Margaret River region continued to be extremely popular, especially in Leeuwin-Naturaliste National Park, which is WA's most visited national park. "This wonderful new campground in the beautiful jarrah, marri and peppermint forest setting of Jarrahdene will give visitors a unique experience from other camping sites in WA. "There are also plans to construct walk and cycle trails to the karri forest and caves in Leeuwin-Naturaliste National Park and link the campground to the Margaret River rail trail."